A new breakthrough from Heriot-Watt University may provide significant insight into neurodegenerative diseases like schizophrenia and epilepsy. A new imaging technique has enabled researchers to capture the exact point and time that information is transferred during neurotransmission. Their research is focused on understanding synaptic events, which are often implicated in neurodegenerative diseases. Neurodegenerative diseases take a heavy toll on patients and their family members. A significant economic burden is also associated with these diseases, since patients that suffer from them require extensive care to survive. Some of the neurological conditions originate in abnormal synaptic function, or the interfaces where nerve cells found in the brain transfer information between each other. Understanding neurotransmission has been limited, however, by the fact that there is a shortage of methods to accurately study what happens at these synaptic junctions. Understanding the dynamics of synapses may now be possible at even the single-molecule level, according to a recent press release. 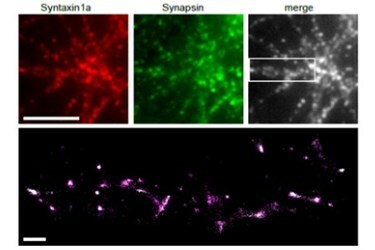 The researchers have developed a new super-microscopy, or “nanoscopy,” method that may allow them to pinpoint where many neurodegenerative diseases take root. 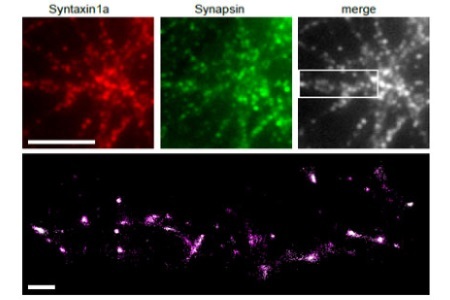 Using their new method, the team studied pre-synaptic proteins inside active synapses, according to a recent study published by the team in Nature Communications. Studying synapses during depolarization has allowed the team to visualize the molecules involved in synaptic vesicle exocytosis. Exocytosis is the function undertaken by the cell to expel neurotransmitters into the synaptic space. The adjacent cell detects the neurotransmitters and, in turn, fires a signal to the next neuron in the series. To achieve these results the team was required to take a multidisciplinary approach to the problem. Mathematics, genetics, and laser physics were combined with molecular biology to create and detect molecules that could be tracked with their equipment. Genes from fluorescent jellyfish and corals were fused to the molecular drivers involved in neurotransmission. Once the neurons start producing the fluorescently tagged proteins, laser light allows them to be visualized in the synapse, giving a dynamic picture of what goes on during transmission. High-speed imaging of biological processes is being studied extensively by many research teams. Recently, a 2D camera was able to visualize actual light pulses by taking up to 100 billion frames per second.